ASL Dictionary HD Spec﻿ial ﻿Edition. 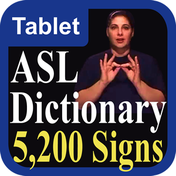 Our most advanced ASL Sign Language Dictionary with over 5,000 Words translated to ASL Video. The ASL American Sign Language Video Dictionary for iPhone and Android. Translate English into ASL, from A - Z, plus the entire numerical system, common English phrases, symbols and much more. The original ASL Dictionary is now available for your Mac. The same ASL Videos with all our latest features including Quiz, Play All, Favorites, adjustable slow motion and no internet required. The same great videos as our ASL Dictionary and loaded with new features only for iPad and Android tablets. ASL Baby sign for iPad and iPhone. The first totally customizable, Baby ASL App. Replace our video with yours, change the image, or the audio. A fun interactive tool to communicate with your baby before they have the ability to speak. Customize the A-Z category with your own Audio, Picture and Video. The only interactive ASL Baby app. iTunes, iPhone, iPad and iPod Touch are registered trademarks of Apple Inc.